Meghans Tiara is that of Queen Mary Diamond Bandeau Tiara. Borrowed from The Queen. The tiara is just gorgeous, as is the veil! The veil is held in place by Queen Mary's diamond bandeau tiara, lent to Ms. Markle by The Queen. The diamond bandeau is English and was made in 1932, with the centre brooch dating from 1893. It's a beautiful tiara and fits so well with her veil. I don't know...just know it doesn't look like what is identified as the QM Diamond Bandeau. Was it also worn by the Duchess of Kent at her wedding ? No. 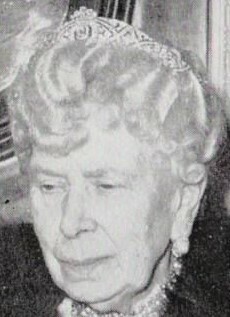 The Duchess of Kent wore one of the Kent tiaras on her wedding day. It was another bandeau owned by Queen Mary. It is believed that it was transformed into the Kent's fringe tiara. Queen Mary had 2 diamond bandeaus. The one you are posting, worn by Alexandra, is not the same one. It was given to Princess Marina of Kent, and later passed to her daughter in law the current Duchess. It is believed to now be the fringe tiara of the Kents. I'm not sure, this is the only decent photo I can find and it doesn't look the same. 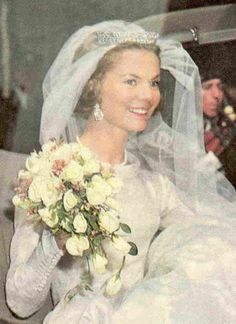 They are not same, especially since that tiara was remodeled into the Kent Diamond and Pearl Fringe tiara, worn by Lady Helen at her wedding. So is this a new to us vault tiara? The palace simply calling what was known as the filigree tiara, Queen Mary’s Diamond Bandeau. It's an older existing tiara from the BRF vaults. A very beautiful and elegant tiara! A wonderful tiara indeed. I am glad that it re-appeared. Unbelievable that it has been collecting dust for decades! Makes you wonder what other treasures still around. Photo does it justice. Stunning tiara. Wont be sad to see her wear it for future events I hope. The things you find when looking through the attic! Beautiful tiara need and perfect for Meghan! Thank you for the link. Gorgeous. I would love to go through the vaults and find out! Meghan must have had a blast going through everything. I love the tiara, I had read about it before but assumed it was well "lost" by now!Its a very good "all round tiara" as I imagine the Duchess of Sussex won't have as many choices as the Duchesses of Cambridge and Cornwall. It's dreamy with this veil! Is it just me or was Meghan given a larger tiara to wear for her wedding than Catherine was given for hers? "The grass was greener / The light was brighter / The taste was sweeter / The nights of wonder / With friends surrounded / The dawn mist glowing / The water flowing / The endless river / Forever and ever......"
Yes, but considering how tiny the halo was, basically had to be. She would have had to wear no tiara honestly to be smaller. There is no rule that the closer to the throne, the bigger the tiara. Besides, as we were told, Kate had the choice of several tiaras to wear. She chose the smaller one. Meghan likely had some choice as well. Meghan's is most likely now her "go to tiara" whereas Kate was always going to have access to more, and bigger, tiaras so only had to pick something to wear for the day itself.